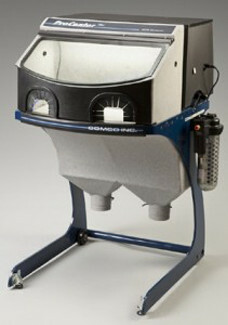 The ProCenter Plus™ combines a compact dust collector and chair-height work chamber in one freestanding unit. It creates a clean, comfortable work environment with great visibility and is the perfect partner to any of our blasters. Comco’s innovative ProCenter Plus delivers a space-saving WorkStation, dust collector and air dryer in one freestanding unit. It is the “everything else” you need to construct the appropriate blasting environment. Designed specifically for MicroBlasting, Comco’s ProCenter Plus combines all necessary accessories into one self-contained system on wheels that is convenient for any workplace. It rolls easily through a standard doorway and has a footprint of only 30″ x 34″. 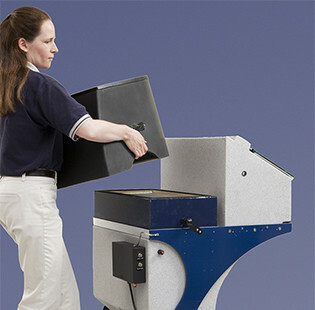 The ProCenter Plus provides an ergonomically-designed MicroBlasting cabinet for any operator. It features chair-height access and wide hand holes that have comfortable, flat, cushioned bases. This space and comfort allow the operator a greater range of motion than conventional irises provide. Operators do not need heavy, awkward gloves if this all-in-one unit is partnered with the focused abrasive delivery of Comco’s AccuFlo® blaster. 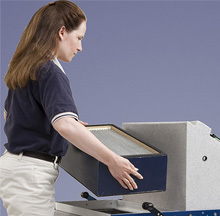 The large viewing area is well lit, and an optional magnifier can be installed to assist with the processing of small parts. Every facet of the design—the shape, materials, and components—takes advantage of modern manufacturing techniques and capabilities to create a rugged and efficient system. The curved floor, air jets, and HEPA filtration all work together to provide a clean work environment during multi-shift blasting without the need for frequent maintenance. Optimizing our downdraft technology. By allowing the spent abrasive to naturally fall through the floor and into the collection hopper, less airflow is required. 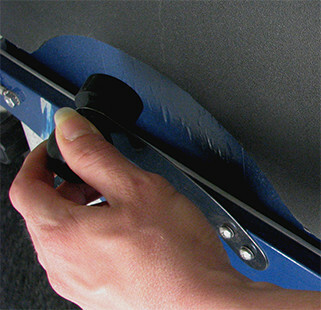 Reducing resistance in the path of the airflow by eliminating places within the system that cause a drop in pressure. The result is a compact system featuring a smaller fan that still achieves high volumes of air flow. Minimizing the velocity of the air as it leaves the system and keeping the airflow away from the operator. 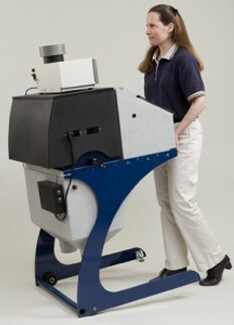 The ProCenter Plus’ wide exhaust port sits on the back of the system and points toward the floor. A powerful dust collector with advanced downdraft technology, the ProCenter Plus comes equipped with an easy-to-replace HEPA filter. Spent abrasive is swiftly evacuated from the large, well-lit chamber, keeping the work area clean. HEPA air filtration means 99.97% of all particles greater than 0.3 micron in size are removed. The air coming out of the ProCenter Plus is cleaner than what goes in, because we believe in leaving a place better than we found it. 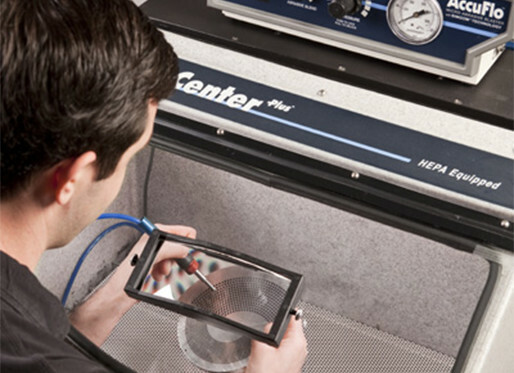 Our HEPA equipped ProCenter Plus efficiently cleans the air before it’s discharged back into the work area. Available on our ProCenter Plus, the ESD control option is designed for static-sensitive applications, such as conformal coating removal, PCB failure analysis, set-top board refurbishments and delicate medical electronics blasting. The ESD Control ProCenter Plus floods the blast chamber with ionized air to dissipate any charge developing through the blasting process. Filter cleaning is a “knock.” The filter mallets allow the operator to quickly knock off spent abrasive that accumulates on the underside of the HEPA filter. Regular use of the filter mallets maintains air flow in the work chamber. 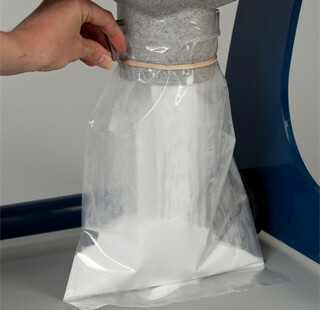 Emptying spent powder from the hopper isn’t the usual mess found with most dust collectors. When cleaning is necessary, removal of spent abrasive is quick and easy with a half-turn of a butterfly valve at the bottom of the hopper. The HEPA filter does not need to be replaced often. When it does, simply lift off the cover to expose and swap the filter. No tools are necessary.